Your 500 pound adventure bike isn’t a ballerina, so learning how to handle the big girl in certain riding situations will save you energy and ultimately lead to a more enjoyable two-wheel experience. From our archives of doing things the hard way, here are three tips to remember when you find yourself riding on hillsides or cliffs, stuck on a log or trying to navigate around a root. 1) Riding on Hillsides and Cliffs – While it may sound counterintuitive, when riding on hillsides you should always remember to avoid the temptation of weighting the inside peg, or the peg facing uphill. To avoid getting sucked in, weigh the outside peg. Similarly when riding near cliffs, avoid the temptation of riding too close to the wall, or you may ride right into it. Riding the outside line adds extra fractions of a second to your reaction window in the event something goes wrong. 2) Tackling Logs and Boulders - If you ride in the woods long enough, there will come a time when you find yourself stuck on a log on the trail. When this happens, the first step is to slow down and assess the situation. Instead of grabbing a handful of throttle, which often just polishes the log, determine whether or not you can move the log out of the way. Often all we have to do is waddle the bike back a foot to get a better line around the obstacle. 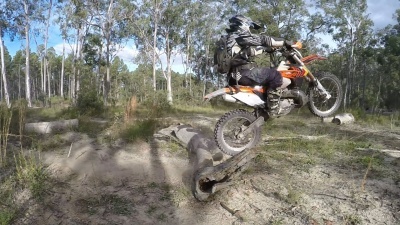 If a log or boulder is immoveable, use your body weight to bump the seat and release the clutch to ride over it. Practice makes perfect, so get yourself intentionally struck to hone your technique. 3) Tackling Rocks and Roots on Hillsides- When tackling large rocks or roots on side hills, avoid the temptation to put your foot down and fit it inside the gap between the bolder or route. Instead, use the obstacle as a pivot by riding right up to the log or boulder and placing your boot on it to maintain control.